Deep, thunderous bass is necessary to complete a powerful home theather system. 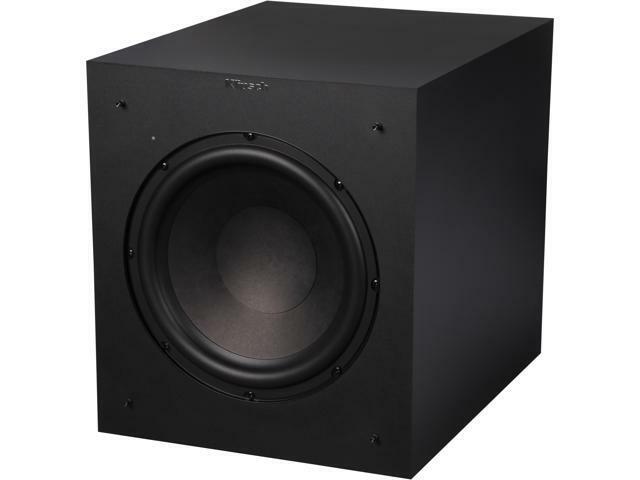 The Klipsch k100-sw subwoofer incorporates the classic appearance and right technology resulting in the ideal subwoofer for high performance configurations. Equipped with a 10" front-fire woofer and the all-digital amplifier, it fills your room with low frequency energy that can not only be heard but felt as well. The front-firing design allows great placement flexibility. Plus, it accepts line/LFE inputs, thus you can hook it up to most receivers available on the market. 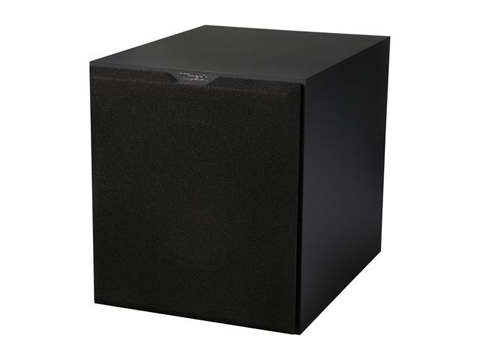 Poly-fiber woofers are exceptionally light while being extremely rigid-providing remarkable low frequency response, with minimal cone breakup and distortion. Allows you to blend the subwoofer's low-frequency tones with other Klipsch speakers as well as establish the ideal level of bass. Let's you know when the system is on or off. Dimensions: 14.00" x 12.50" x 15.70"
Pros: Small, black and indiscrete. This is the perfect sub for my setup (7.2 Channel). It is located in the basement and you can feel and hear the boom on the third floor. Great product and quality. You will not be disappointed. Pros: this subwoofer has lasted since i bought it. i have bought other subs that did not last more than 3 months. but I have had these over a year and they are kicking great. Cons: I had a 300 watt 12 inch infinity sub woofer that quit working and the klipsch just doesn't put out like a 12 inch but I guess I was spoiled. Pros: Nice looking. Good sound. Other Thoughts: Over all, I would say this a great starter sub. The IO options are basic, wish it had a dedicated LFE Sub option. This would work well in a small apartment where you'd want to be considerate of your neighbors. If you are looking to buy this sub to knock walls down with either music or movies, I would get at least 2 or look for a more substantial 12ver. Pros: - Size - For me the unit is a perfect size. It can fit into smaller areas of the room and largely go unnoticed. - Power - This unit has a physical switch (a tiny metal one) that allows you turn it off, set it to stay in standby and wait for signal to turn on or to just remain on all the time. Handy, but I don't believe this unit has an "anti-thump" circuit so it does make a noise for me when it activates. - Sound - When I first plugged it in I wasn't too impressed. I only paid $124 for it so I wasn't expecting greatness but after I recalibrated my receiver with it that all changed. This 10" sub was able to add a lot of low end that I wasn't expecting. The sound radiates well and doesn't sound directional to me. This sub is well worth the price that I paid for it. Cons: - Port Noise - This unit can have "chuffing" port noise when you crank it up. This is really easy to do if your receiver is sending a "test noise" to it. I kept the crossover setting at below 80Hz and the gain below 50% and that took care of the problem. - LED - There is a green LED on the front that glows when the unit is on. It's actually behind the grill but you can see it glowing. My sub is out of my line of sight tho so I didn't bother to tape over it. Other Thoughts: For the cost this sub is great. Just have to be aware of the crossover setting and gain on the back of the sub. Setting that crossover on the high end will definately cause the sub to playback higher "bass" sounds that won't sound good at all. I found that I got the best response by keeping the crossover under 80hz and the gain under 50%. After receiver calibration my Denon set the sub level at -12. I pretty much left it that low because the sub will put out a lot even being turned down that much. One more random comment. If you can get a test tone out of the sub but it doesn't play anything when you are listening to stuff, that is not a defect with the sub. Many receivers have a setting for LFE (low frequency effects) that is designed to send only signals designated as LFE to the sub. Music doesn't contain info like that. I had to go in on my receiver and set the sub to be "LFE+Main" so that it would play when I wasn't watching movies. Pros: This is an awesome sub. I have a velondyne sub and this blows it out the water. I'll be getting another one. For the price you can't beat it.